Management goals include maintenance of general health and well-being, achieving a euthyroid state (without post-treatment hypothyroidism), and promotion of smoking cessation. Both smoking cessation and euthyroidism help prevent further exacerbation and decrease the duration of active disease. From an ophthalmologist's perspective, the primary goal is to preserve visual function, while also preventing exposure keratopathy, correcting diplopia, and improving blink dynamics and cosmesis. Smoking cessation is a key part of treatment. Smokers are twice as likely to develop Graves' disease when compared to nonsmokers. Patients with Graves' disease who smoke are 7.7 times more likely to develop TED when compared to nonsmokers. Smoking reduces the effectiveness of TED treatments such as corticosteroids and RAI. TED is a self-limiting disease, with patients moving from the active to quiescent phase within 1-3 years with a 5-10% risk of recurrence . Treatment for TED should start at the time of the diagnosis, as treatment becomes less effective as the disease progresses from the early, acute, active phase to the chronic quiescent phase. Early initiation of therapy is crucial in diminishing the final severity of disease manifestations. Treatment initiated during the early months of the active inflammatory phase has been shown to be most effective. Initiation of therapy during the final months of active inflammatory phase has little effect on the final outcome of disease. Once the chronic fibrotic stage has set in, treatment options become more limited, i.e. primarily surgical. Figure 22: Rundle's curve. 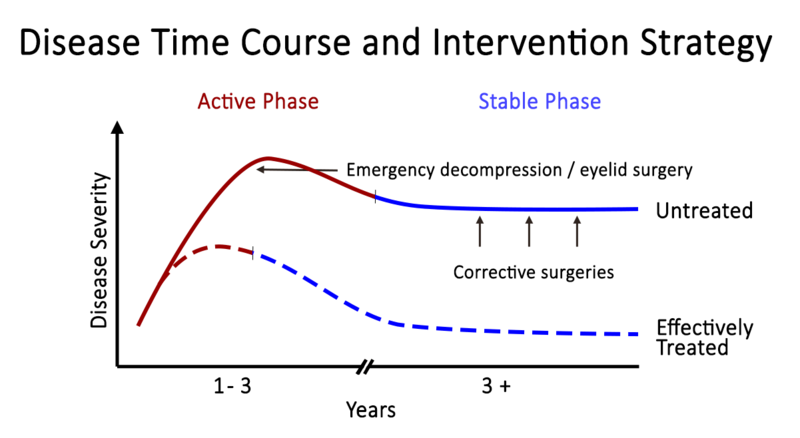 As seen in the representation of TED activity over time in the Rundle's curve, early initiation of therapy is crucial in diminishing the final severity of disease manifestations. The majority of patients with TED (~75%) have mild to moderate disease and require primarily supportive care as a means of symptom management. Ocular lubrication, by way of daytime eyedrops and nighttime ophthalmic ointment, is the mainstay of treatment for mild to moderate disease. Topical cyclosporine has been shown to be beneficial in reducing symptoms of ocular surface irritation . Oral NSAIDs can be used if periocular pain is a prominent complaint . In the presence of diplopia, temporary press-on prism lenses (e.g. Fresnel) can be utilized. Once stability in diplopia is achieved, the prism can be ground into glasses. Alternatively, for stable diplopia, the patient may undergo strabismus surgery, assuming the patient has been in the stable phase of TED for several months. Mineral supplementation with selenium, when taken regularly, has been shown to exert a significant benefit in European patients with mild, non-inflammatory orbitopathy, but the benefit of this supplementation in other regions is debated . Approximately 20% of patients with TED undergo some type of surgical intervention . In one study, 13% of patients with TED had eyelid surgery, 9% strabismus surgery, and 7% orbital decompression . As a general guideline, surgery is not advised until a euthyroid state is maintained and the TED has been in the stable phase for at least 6-9 months. Exceptions include visual loss from compressive optic neuropathy or corneal exposure, in which cases urgent surgical intervention is warranted. Aside from threatening vision and causing ocular and orbital pain, TED can be disfiguring and emotionally and psychologically taxing for many patients. Waxing and waning symptoms can be frustrating for both patient and provider. Education and reassurance are integral components of patient care. Peer support groups are invaluable for many patients. The following section starts with an overview of managing hyperthyroidism, followed by the different treatment options used in TED. It concludes with a discussion about therapeutic modalities specific to each sign or symptom associated with TED. While the course of TED does not parallel the status of systemic thyroid disease, achieving a euthyroid state is an important part of management. Hyper- or hypothyroidism has been associated with a greater severity score than euthyroid patients. Restoration of a euthyroid state by antithyroid drugs has been associated with improvement of TED over several months . Oral beta-blockers can be used for symptom control (Figure 23). They decrease conversion of free T4 to T3. They decrease heart rate, palpitations, anxiety, and heat intolerance. Propylthiouracil and methimazole, thiourea derivatives, are used for thyroid hormone suppression. Remission rates are 30-50% at 12-24 months . Relapse and/or hypothyroidism can occur. Thyroidectomy can successfully treat the hyperthyroid state. Nearly half of patients will become hypothyroid following surgery so close monitoring is needed . Many studies have shown that post-thyroidectomy hypothyroidism results in worsening progression of TED . Consider thyroidectomy in patients who are high risk for severe exacerbations of hyperthyroidism and are refractory to other treatment modalities . 80% of patients achieve a hypothyroid state at 6-12 months . RAI therapy is known to exacerbate TED in nearly 1/3 of patients undergoing treatment . This may be caused by an increased release of TSH-R antigens from the thyroid cells, which enhances the immune response . Smokers are more likely to demonstrate worsening following RAI . Closely monitor thyroid labs following RAI therapy . "Block and replace" therapy (RAI + methimazole + thyroxine) has been shown to limit post-RAI hypothyroidism . RAI with moderate-dose oral prednisone is indicated when the risks of worsening TED outweigh the potential risks of systemic side effects from glucocorticoid therapy . This hypermetabolic state is triggered by release of excessive thyroid hormone, which can lead to severe hypotension, heart failure, and shock. It is inevitably fatal if untreated. Triggers include stress (i.e. surgery, anesthesia), thyroid surgery, or RAI. To prevent thyrotoxicosis, avoid operating on patients who are currently hyperthyroid. Figure 23: Anti-thyroid drug mechanisms. 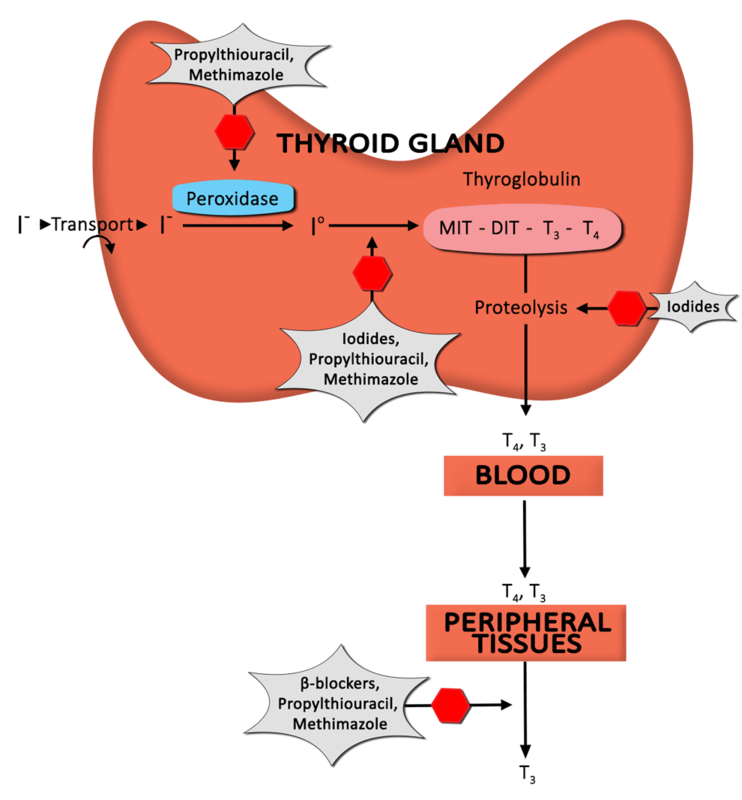 This diagram depicts the formation of thyroid hormone, as well as the mechanism of action of anti-thyroid drugs to decrease levels of circulating thyroid hormone. Corticosteroids are a mainstay of treatment in TED. The benefit derived from corticosteroid administration is due to anti-inflammatory and immunosuppressive effects. Unfortunately, a significant percentage of patients respond only partially (or not at all), and recurrences upon dose reduction or cessation are not infrequent . This is typically started in high doses (60-100 mg daily). Multiple studies show a mean effectiveness rate of ~ 60%. Compared to oral administration, IV is usually better tolerated and more effective (mean effectiveness ~ 70%). Compared to months of treatment with oral prednisone, IV treatment usually lasts 12 weeks (6 weeks – 500 mg once weekly; 6 weeks – 250 mg once weekly), which allows for easy and early detection of "non-responders." IV decreases the need for additional medical therapy. If prolonged high-dose treatment is anticipated, treat with calcium, vitamin D, and a proton pump inhibitor (for patients at high risk for gastric ulceration). Incorporate frequent monitoring of serum electrolytes, blood glucose, liver function tests (LFTs), and blood pressure. Patients receiving cumulative doses exceeding 8 g are at risk for hepatic toxicity, electrolyte disturbances, and cardiac arrhythmias . Orbital radiotherapy (ORT) has been used in the management of TED for nearly a century and can be used alone or in conjunction with corticosteroids [26 ,27]. Terminal differentiation in orbital fibroblasts is induced. Adipocyte differentiation and fatty hypertrophy are limited. This is more effective in patients < 40 years old who have more orbital fat hypertrophy. Radiation induces death of tissue-bound monocytes. Radiation blunts the immune response at the orbit, reducing inflammation of both the ocular surface and eyelids in ~ 60% of patients . ORT has not been shown to have notable effects on proptosis or eyelid retraction. Use 2000 cGy, administered over 10 treatment sessions, during a 2-week time course . A maximum effect occurs around 6 months post-treatment . Treatment is associated with a transient exacerbation of periorbital edema, conjunctival injection, and chemosis . The role of ORT monotherapy has been controversial due to highly irregular results . Effectiveness rates range from 20% - 90% in previously published studies. The most convincing evidence for benefit is found in the treatment of restrictive vertical strabismus. A recent Cochrane review concluded that the combination of corticosteroids + ORT has a more sustained anti-inflammatory effect, leading to a decreased risk of compressive optic neuropathy in active TED patients, when compared to treatment with either corticosteroids or ORT monotherapy . Patients with underlying microvascular retinopathy (e.g. diabetic or hypertensive retinopathy) have an increased incidence of radiation retinopathy (1-2%). Patients may have increased risk of cataracts. There is a theoretical concern for tumorigenesis, and thus, ORT is typically avoided in patients younger than 35 years. When taken regularly for one year, selenium has been shown to exert significant benefits in patients with mild, non-inflammatory orbitopathy. One study showed a benefit from selenium supplementation (100 µg twice daily) in Europe where the soil was selenium deficient. The benefit of selenium supplementation from non-selenium-deficient populations is not known. This is a chemotherapeutic agent that inhibits DNA synthesis. It is currently being studied in a Combined Immunosuppression and Radiotherapy in TED (CIRTED) trial . Sporadic case reports have shown a benefit with use of the anti-TNF alpha biologics infliximab and etanercept. This targets CD-20 on B-cells, which leads to B-cell depletion in the thyroid gland and decreased TSI production. A recent study showed TED patients with CAS ≥ 4 that received rituximab (1000 mg, IV, twice over a two week interval) showed an average decrease in CAS that ranged from 2.3 to 4.7, with a median decrease ranging from 2.5 to 4.5. The overall efficacy of rituximab therapy is complicated by the variable presentations and course of TED. This is a human monoclonal antibody (Graves' Disease IgG – GD-IgG) against the IGF-1-R recently investigated (phase II clinical trial) in patients with active, moderate to severe TED. IGF-1-R has mitogenic and anti-apoptotic functions. GD-IgG interacts directly with IGF-1-R.
IGF-1-R is upregulated in TED. Anti-IGF-1-R therapy may interfere with this abnormal signaling pathway present in TED. Liaboe CA, Clark TJ, Shriver EM, Carter KD. Thyroid Eye Disease: An Introductory Tutorial and Overview of Disease. EyeRounds.org.